There are more stories about the Titanic than you can shake a stick at, and there may have actually been some stick shaking going on - followed by some fetching. According to J. Joseph Edgette, professor emeritus of education and folklorist emeritus at Widener University, in a post to the university's website, there were twelve dogs on board. 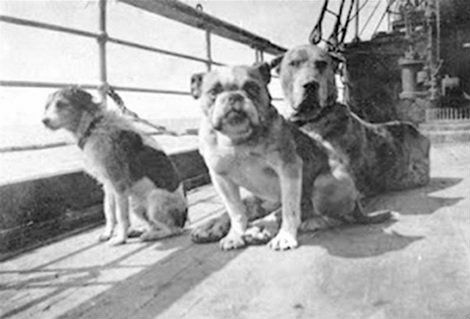 Three of the dogs stayed in the cabins with their first class owners, while the other nine were kept in kennels and cared for by the ship's crew. This, of course, gave new meaning to the term "poop deck," as dogs will be dogs. The three dogs staying in the cabins (two Pomeranians and a Pekingese) all survived, carried into the lifeboats by their owners. The other nine perished when the ship sank, even though they had apparently been freed by the crew. One owner, Ann Elizabeth Isham, refused to get into a lifeboat without her dog. Both perished in the disaster. Neither was available for comment via seance. There is a rumor that a Newfoundland also survived by swimming until the rescuing ship, the Carpathia, was able to fish him out of the ocean. However, no documentation has been found to back up this story, according to the website Titanic Stories. No Newfoundlands were listed with an owner on the passenger manifests, however, it is possible, no matter how unlikely with a dog the size of a small horse and the drooling capacity of a gallon a day, that he was a stowaway. While the cause of the disaster remains focused on the untimely collision with an iceberg, it should be noted that rumors abound that the ship's cat and her kittens disembarked while the ship was still docked in England. While the truth to these rumors remains unfounded, it does beg the question, "what did the cat know and when did she know it?" Perhaps the whole incident was a vast cat conspiracy to take out the pooches of the rich and famous and she was the puss on the inside. Perhaps she had a paw in sinking the Titanic herself. Was the Titanic somehow sabotaged by the world's cat population? The world may never know. Have you seen 20 Ways To Organize Your Cats?